Background: There is an ongoing debate if bone graft substitutes (BGSs) are beneficial in the treatment of displaced intra-articular calcaneal fractures (DIACFs). The purpose of this study was to evaluate the effect of an injectable calcium sulfate/hydroxyapatite BGS (CERAMENTTM iBONE VOID FILLER, BONESUPPORT AB, Lund, Sweden) in internal fixation of calcaneal fractures. Methods: The records of patients presenting with calcaneal fractures type Sanders III and IV and treated with internal fixation plus BGS were reviewed. Radiographs were analyzed using different measurements (including Böhler's angle and calcaneal facet height). The clinical outcome was evaluated using the American Orthopaedic Foot and Ankle Society (AOFAS) Ankle-Hindfoot Scale. Results: A total of 20 fractures were available for radiographic and clinical examination at a minimum follow-up of 12 months. No decrease in Böhler's angle was recorded in six fractures, a reduction of <5° in 6 and of more than 5° in 8 fractures. In all fractures, the BGS was completely resorbed at 12 months on radiographs. The AOFAS score was on an average 89.8 (range, 68–99) at 1-year follow-up and indicated an excellent outcome in 11, a good outcome in 8, and a fair outcome in 1 fracture. Conclusions: The study results support the use of an injectable, in situ hardening calcium sulfate/hydroxyapatite BGS in DIACFs. The BGS is easy and safe to use as an augment to open reduction and internal fixation. Displaced intra-articular calcaneal fractures (DIACFs) are devastating injuries associated with long and often unsatisfactory recovery and life-altering consequences., About 40%–85% of patients return to work within 9 months, but approximately 20% are not able to return to work within a year., Within the past 25 years, the trend toward operative therapy with the anatomical reconstruction of the calcaneal height, length, and the subtalar joint has improved the clinical outcome in general, but problems concerning residual pain, limited range of motion in the subtalar joint, and posttraumatic arthritis remain. This could lead to the speculation that initial cartilage destruction is more important and might be a better predictor of clinical outcome than maintaining the reduction postoperatively. However, until this question has been conclusively answered, the patient should be provided with the most optimal treatment and the lowest risk profile. Autografts, especially cancellous bone autografts from the iliac crest have a significant risk of morbidity, which should limit their use.,,, Allograft carries a small risk of transmitting diseases and has limited availability in good quality. Therefore, BGS have been introduced to limit these risks. The purpose of this study was to evaluate the effect of an injectable calcium sulfate/hydroxyapatite BGS that shows quick remodeling into host bone, in the treatment of DIACFs. This property should further reduce the risk profile of BGS and result in a completely biological bone repair. A total of 23 consecutive DIACFs in 18 patients (eight females, 10 males) with a mean age of 45.7 years (18 to 78 years) who underwent surgical treatment were included in this study. Five patients had bilateral fractures, of which two were managed conservatively, and eight were treated surgically with the combination of internal fixation with a locking plate and injection of the BGS. Consecutive patients presenting at our hospital with closed DIACFs according to Sanders classification type III and IV  between September 2010 and November 2014 were included in the study. Surgical management consisted of open reduction internal fixation with a calcaneal locking compression plate (LCP) and bone defect reconstruction using an injectable calcium sulfate/hydroxyapatite BGS. Patients with DIACFs according to the Sanders classification type I and type II were not included in this study because these types usually do not present with a significant bone defect. Patients with open fractures were not included since the surgical management is different to the treatment of closed fractures. Moreover, patients with calcium metabolism disorders or a known allergy to components of CERAMENT ™|BONE VOID FILLER (calcium sulfate, hydroxyapatite, Iohexol, or other iodine-containing substances) were excluded as well for safety reasons. Patient demographics, medical history, comorbidities and computed tomography (CT) fracture classification were collected prospectively. Prolonged wound healing, radiographic follow-up of fracture consolidation, and clinical follow-up were recorded retrospectively as outcome objectives. The outcome was assessed by an independent reviewer to ensure that all negative outcomes were recorded. For the radiographic follow-up and the quality of bone void filling by newly-formed bone X-rays were assessed by an independent examiner that was not involved in the treatment of the patients. Initially, each fracture was classified by the Sanders classification based on coronal CT slides. All patients were treated according to the basic principles of surgery of calcaneal fractures. Initial bed rest with cryotherapy, compression, elevation, pain management, and medical antiphlogistic therapy was used to reduce soft-tissue swelling and skin problems. Surgery was planned after complete consolidation of soft tissue had been achieved. For prophylaxis of infection a single shot of Cefuroxime 1.5 g was given intravenously. A standard lateral L-shaped incision was used to expose the fracture. After open reduction, the fragments were temporally fixed with several 1.4 or 1.6 K-wires and the reduction controlled using fluoroscopy. 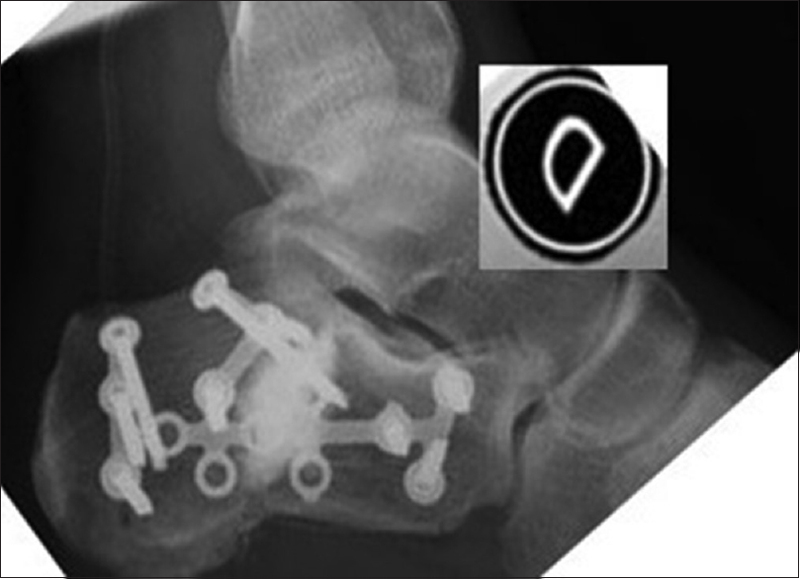 A LCP (Locking calcaneal plate, Depuy-Synthes, Oberdorf, Switzerland) was placed and fixed with locking screws [Figure 1] and [Figure 2]a. After fixation of the plate, the central cancellous bone defect was filled with CERAMENT™|BONE VOID FILLER [Figure 2]b. The BGS should be injected into a dry bony cavity. Therefore, a surgical tourniquet was used, if appropriate, until the BGS had hardened. Each defect was filled completely and no additional material was added to the product. At the end of surgery, direct skin closure was achieved in all patients. Standard wound care was applied. Patients were mobilized non-weight-bearing using crutches for 6 weeks, followed by a further 6 weeks of weight bearing as tolerated with a walker. The primary outcome parameter was a calcaneal collapse in the follow-up radiographs. Therefore, Böhler's angle, the crucial angle of Gissane, calcaneal facet height, and absolute foot height were compared in the immediate postoperative period and the 1-year follow up. Secondary outcome parameters included the assessment of filling of the central cancellous bone defect with bone regenerate, the rate of complications (including prolonged wound healing, superficial and deep infection and the need for revision surgery) and clinical outcome. Resorption of the BGS and filling of the bony defect was accessed by comparing the immediate post-operative radiographs with follow-up radiographs at 1 year. The final clinical outcome of the patients was evaluated by the American Orthopaedic Foot and Ankle Society (AOFAS) Ankle-Hindfoot Scale. The mean clinical follow-up was 22.6 months (12–52 months). No patient died during the follow-up period. According to the Sanders classification, there were 11 type III and 10 type IV fractures. Twenty fractures were available for a radiographic follow-up examination at 1 year. Böhler's angle was pre-operative − 8.9° on an average (range − 47° to 22°), post-operative 23.6° (0°–42°) and at the 1-year follow-up 19.3° (−31°–38°) [Table 1]. There was no decrease in Böhler's angle at 1 year in six fractures. A slight reduction in Böhler's angle of ≤5° at 1 year was found in six and of >5° in eight fractures. In the case of a decrease in Böhler's angle >5°, there were two calcaneal collapses of −15°, and −31°, respectively. The mean crucial angle of Gissane after surgery was 79.6° (21°–131°) and at the 1-year follow-up 87.3° (41°-138°) [Table 1]. For calcaneal facet height pre-operative 46.7 mm (34–88 mm), postoperative 48.1 mm (34–61 mm) and at the 1-year follow-up 48.9 mm (32–63 mm) were recorded. The absolute foot height was preoperative 83.1 mm (57–142 mm), postoperative 72.2 mm (54-86 mm) and 71.7 mm at 1 year (57–84 mm). The BGS was clearly visible on the postoperative radiographs due to the radiocontrast agent Iohexol [Figure 3]. On the radiographs at 1 year, the BGS could not be distinguished from the surrounding bone anymore; remnants of the BGS were not visible [Figure 4]. New bone formation, however, could not be quantified on the follow-up radiographs because of overlapping with the LCP-plates and screws and the cortical bone. Exact quantification would only be possible using CT scans, which is not acceptable from an ethical perspective in patients with a good clinical outcome (high dose of radiation). Twenty patients were available for the clinical follow-up examination at a minimum of 1 year. The AOFAS score was on average 89.8 (range 68–99) and indicated an excellent outcome (>90 points) in eleven fractures, a good outcome (75–90 points) in eight and a fair outcome (50–74 points) in one fracture. 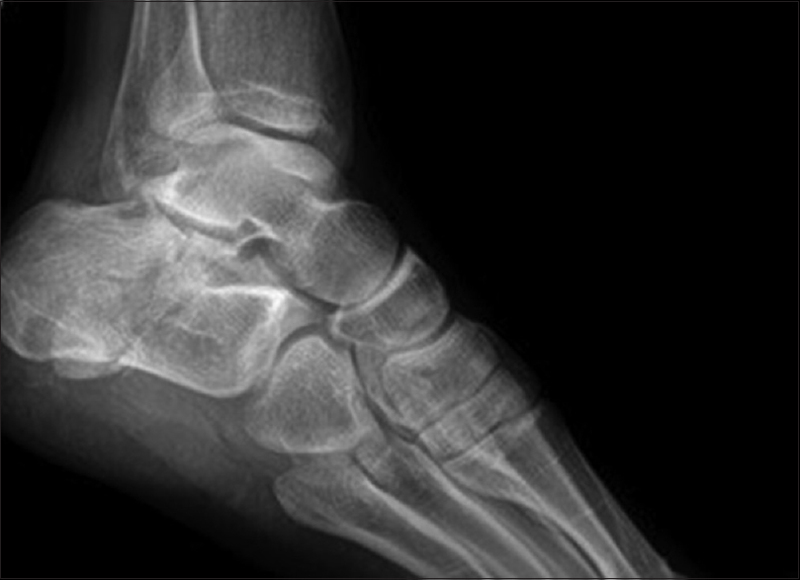 Two patients had a calcaneal collapse on the follow-up radiographs at 1 year. Both patients did not follow the postoperative non-weight bearing regime. The first patient, a 63-year-old female had a Böhler's angle of −15° at 36 months, but a clinically satisfying result with 75 points in the AOFAS score. The second patient's Böhler's angle was −31 and had an AOFAS score of 92 points. In 15 fractures, the incisions healed without prolonged wound secretion or collection of fluid. Prolonged wound drainage was noted in five fractures; four fractures were managed expectantly with dressings. In these patients, the secretion stopped without further intervention within 15 days (longest drainage). Disturbed wound healing was noted in one patient. In this patient revision surgery with debridement and soft-tissue closure was performed. Further wound healing was without complication after revision surgery. No postoperative osteomyelitis occurred in any of the patients. There is an ongoing debate about whether the use of bone grafts or BGS in combination with internal fixation is beneficial for the patient in the treatment of DIACFs. Some authors consistently use bone grafts,,,, some in selected cases,, and others not at all.,, The opposing positions appear to be almost irreconcilable. To end this discussion, probably a large, multicenter randomized controlled trial with strict inclusion criteria and a set of outcome measures would be necessary. Until this data are available, the patient should receive the most optimal treatment and the lowest risk profile. A resorbable and injectable hydroxyapatite/calcium sulfate biocomposite has shown satisfying results in the treatment of distal radius fracture malunions  and tibial plateau fractures. The BGS has the capacity to be transformed into host bone, leaving no remnants of the material behind. Our radiographic results showed a good reconstruction of the posterior facet with an average Böhler's angle of 23.6°, which is comparable to the results of Singh and Vinayfor type Sanders III and IV fractures using autograft. The loss of Böhler's angle at the 1-year follow-up was 4.3° on average. Singh and Vinay found a reduction of 3.5° at 2 years using autograft and 6.2° without bone grafting. Schildhauer et al. and Elsner et al. noted no reduction of Böhler's angle using a calcium phosphate cement (Norian SRS, Norian Corporation, Cupertino, CA, USA)., The value for a bioresorbable calcium phosphate paste (α-BMS, Etex Corporation, Cambridge, MA, USA) was 6.2° at 1 year  and for a nanocrystalline hydroxyapatite 3.8° at 1 year. Our radiologic results fit well into the range of bioresorbable BGS found by other authors. The AOFAS score of the 20 fractures available for follow-up analysis was 89.8, which indicates a good outcome in general. Singh et al. found an AOFAS score of 76.4 for patients treated with internal fixation and autograft. The comparison of the clinical outcome of studies using BGS in DIACFs is difficult since many different outcome measures are used (AOFAS, SF 36, Creighton-Nebraska Health Foundation scale, Kerr calcaneal score and Zwipp foot score). The AOFAS score, the Creighton-Nebraska Health Foundation scale and the Kerr calcaneal score have in common that points are given for different objectives, such as the absence of pain, walking ability and working ability. The maximum is 100 points; usually,>90 points indicates an excellent result. Schildhauer et al. reported a Kerr calcaneal score of 80.2 for Norian SRS  and Huber et al. of 86.0 on the Creighton-Nebraska Health Foundation scale for nanocrystalline hydroxyapatite. As a general approximation, our clinical results are comparable with the results reported by other surgeons using bone grafts or BGS. The revision rate in our cohort was 5.6%, with one patient requiring wound revisions due to disturbed wound healing, but no implant-related infection or osteomyelitis developed. The rate of delayed wound healing can be as high as 25% in the surgical treatment of calcaneal fractures, with a risk of deep infection of 1%–4%., In smaller cohorts, the rate of infection is reported as 11%, 6.9%, 5.3%, 3.8%, and 3.7%, respectively. The risk of infection seems to be comparable in all the cohorts reported. The use of CERAMENT™|BONE VOID FILLER showed good radiological and clinical results, which are comparable to autograft and other commercially available BGS in the treatment of DIACFs. The biocomposite was not distinguishable in the follow-up radiographs at 6 months with transformation into host bone. The generation of new bone is not only beneficial for long-term stability but might also serve as bone stock in the case of future subtalar fusion surgery because of posttraumatic arthritis. Buckley R, Tough S, McCormack R, Pate G, Leighton R, Petrie D, et al. Operative compared with nonoperative treatment of displaced intra-articular calcaneal fractures: A prospective, randomized, controlled multicenter trial. J Bone Joint Surg Am 2002;84-A: 1733-44. Howard JL, Buckley R, McCormack R, Pate G, Leighton R, Petrie D, et al. Complications following management of displaced intra-articular calcaneal fractures: A prospective randomized trial comparing open reduction internal fixation with nonoperative management. J Orthop Trauma 2003;17:241-9. Barei DP, Bellabarba C, Sangeorzan BJ, Benirschke SK. Fractures of the calcaneus. Orthop Clin North Am 2002;33:263-85, x.
Brauer CA, Manns BJ, Ko M, Donaldson C, Buckley R. An economic evaluation of operative compared with nonoperative management of displaced intra-articular calcaneal fractures. J Bone Joint Surg Am 2005;87:2741-9. Sanders R, Vaupel ZM, Erdogan M, Downes K. Operative treatment of displaced intraarticular calcaneal fractures: Long-term (10-20 years) results in 108 fractures using a prognostic CT classification. J Orthop Trauma 2014;28:551-63. Leung KS, Yuen KM, Chan WS. Operative treatment of displaced intra-articular fractures of the calcaneum. Medium-term results. J Bone Joint Surg Br 1993;75:196-201. Singh AK, Vinay K. Surgical treatment of displaced intra-articular calcaneal fractures: Is bone grafting necessary? J Orthop Traumatol 2013;14:299-305. Schildhauer TA, Bauer TW, Josten C, Muhr G. Open reduction and augmentation of internal fixation with an injectable skeletal cement for the treatment of complex calcaneal fractures. J Orthop Trauma 2000;14:309-17. Huber FX, Hillmeier J, McArthur N, Kock HJ, Meeder PJ. The use of nanocrystalline hydroxyapatite for the reconstruction of calcaneal fractures: Preliminary results. J Foot Ankle Surg 2006;45:322-8. Johal HS, Buckley RE, Le IL, Leighton RK. A prospective randomized controlled trial of a bioresorbable calcium phosphate paste (alpha-BSM) in treatment of displaced intra-articular calcaneal fractures. J Trauma 2009;67:875-82. Huang PJ, Huang HT, Chen TB, Chen JC, Lin YK, Cheng YM, et al. 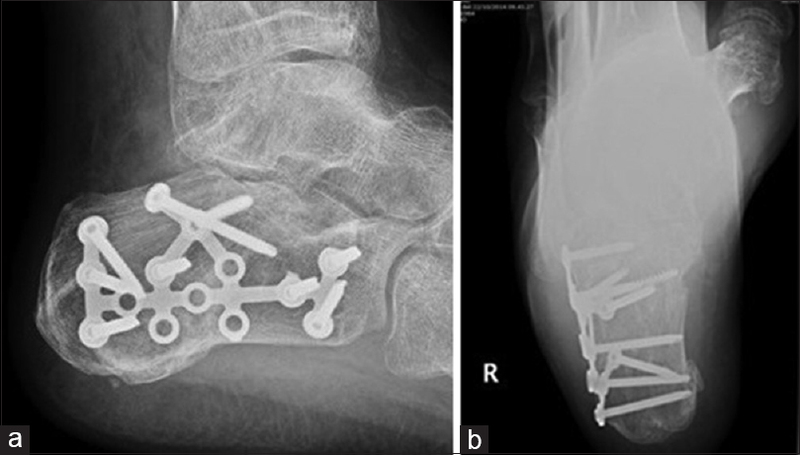 Open reduction and internal fixation of displaced intra-articular fractures of the calcaneus. J Trauma 2002;52:946-50. Eastwood DM, Langkamer VG, Atkins RM. Intra-articular fractures of the calcaneum. Part II: Open reduction and internal fixation by the extended lateral transcalcaneal approach. J Bone Joint Surg Br 1993;75:189-95. Banwart JC, Asher MA, Hassanein RS. Iliac crest bone graft harvest donor site morbidity. A statistical evaluation. Spine (Phila Pa 1976) 1995;20:1055-60. Goulet JA, Senunas LE, DeSilva GL, Greenfield ML. Autogenous iliac crest bone graft. Complications and functional assessment. Clin Orthop Relat Res 1997;339:76-81. Kurz LT, Garfin SR, Booth RE Jr. Harvesting autogenous iliac bone grafts. A review of complications and techniques. Spine (Phila Pa 1976) 1989;14:1324-31. Summers BN, Eisenstein SM. Donor site pain from the ilium. A complication of lumbar spine fusion. J Bone Joint Surg Br 1989;71:677-80. Thordarson DB, Bollinger M. SRS cancellous bone cement augmentation of calcaneal fracture fixation. Foot Ankle Int 2005;26:347-52. Larsson S, Bauer TW. Use of injectable calcium phosphate cement for fracture fixation: A review. Clin Orthop Relat Res 2002;395: 23-32. Elsner A, Jubel A, Prokop A, Koebke J, Rehm KE, Andermahr J, et al. Augmentation of intraarticular calcaneal fractures with injectable calcium phosphate cement: Densitometry, histology, and functional outcome of 18 patients. J Foot Ankle Surg 2005;44:390-5. De Long WG Jr., Einhorn TA, Koval K, McKee M, Smith W, Sanders R, et al. Bone grafts and bone graft substitutes in orthopaedic trauma surgery. A critical analysis. J Bone Joint Surg Am 2007;89:649-58. Sanders R, Fortin P, DiPasquale T, Walling A. Operative treatment in 120 displaced intraarticular calcaneal fractures. Results using a prognostic computed tomography scan classification. Clin Orthop Relat Res 1993;290:87-95. Heier KA, Infante AF, Walling AK, Sanders RW. Open fractures of the calcaneus: Soft-tissue injury determines outcome. J Bone Joint Surg Am 2003;85-A: 2276-82. Bratzler DW, Houck PM; Surgical Infection Prevention Guidelines Writers Workgroup, American Academy of Orthopaedic Surgeons, American Association of Critical Care Nurses, American Association of Nurse Anesthetists, et al. Antimicrobial prophylaxis for surgery: An advisory statement from the national surgical infection prevention project. Clin Infect Dis 2004;38:1706-15. Benirschke SK, Sangeorzan BJ. Extensive intraarticular fractures of the foot. Surgical management of calcaneal fractures. Clin Orthop Relat Res 1993;292:128-134. Schepers T, Ginai AZ, Mulder PG, Patka P. Radiographic evaluation of calcaneal fractures: To measure or not to measure. Skeletal Radiol 2007;36:847-52. Kitaoka HB, Alexander IJ, Adelaar RS, Nunley JA, Myerson MS, Sanders M, et al. Clinical rating systems for the ankle-hindfoot, midfoot, hallux, and lesser toes. Foot Ankle Int 1994;15:349-53. Zwipp H, Tscherne H, Thermann H, Weber T. Osteosynthesis of displaced intraarticular fractures of the calcaneus. Results in 123 cases. Clin Orthop Relat Res 1993;290:76-86. Abramo A, Geijer M, Kopylov P, Tägil M. Osteotomy of distal radius fracture malunion using a fast remodeling bone substitute consisting of calcium sulphate and calcium phosphate. J Biomed Mater Res B Appl Biomater 2010;92:281-6. Iundusi R, Gasbarra E, D'Arienzo M, Piccioli A, Tarantino U. Augmentation of tibial plateau fractures with an injectable bone substitute: CERAMENT™. Three year follow-up from a prospective study. BMC Musculoskelet Disord 2015;16:115. Nilsson M, Wang JS, Wielanek L, Tanner KE, Lidgren L. Biodegradation and biocompatability of a calcium sulphate-hydroxyapatite bone substitute. J Bone Joint Surg Br 2004;86:120-5. Clare MP, Sanders RW. Calcaneus fractures. Unfallchirurg 2011;114:869-76.